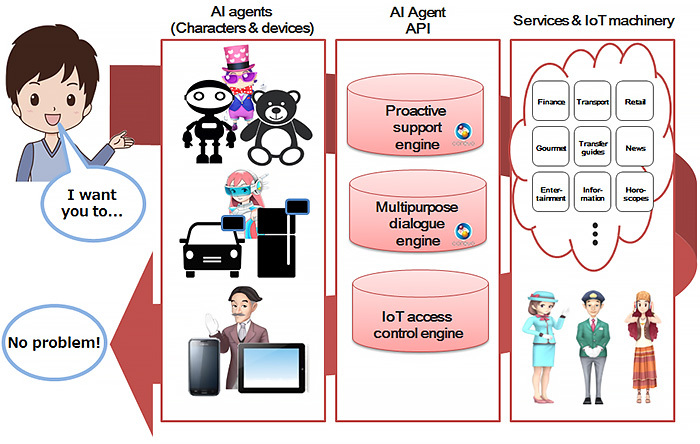 TOKYO, JAPAN, June 23, 2017 --- NTT DOCOMO, INC. announced today its new docomo AI Agent Open Partner Initiative to facilitate collaborative development of all-new offerings implemented with a service-agnostic, device-agnostic speech interface based on AI Agent API, a newly developed artificial intelligence (AI) application programming interface (API) that DOCOMO plans to incorporate into a new AI agent service to be launched in early fiscal 2018. Through the initiative, DOCOMO expects to create an open environment for diverse services that use AI technology for highly tailored services and marketing. The initiative will enable partner companies to link their services to DOCOMO's payment options, such as docomo Mobile Payment, and d POINT CLUB (loyalty program). 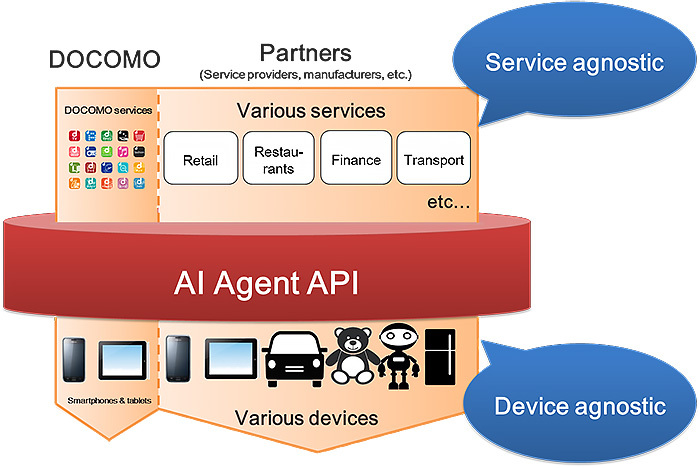 AI Agent API will provide a new foundation for DOCOMO's strategy to help customers realize increasingly innovative lifestyles, a pillar of the company's "Declaration beyond" business strategy to 2020. The API will be the basic system for building new AI agents consisting of a proactive support engine, multipurpose dialogue engine and IoT access control engine. The engines are based on corevoTM AI technologies developed by the NTT Group, including DOCOMO. By making the API openly available to a diverse range of service and device providers, DOCOMO expects to create win-win business relationships with partners, reduce the development period for AI-agent services, and ultimately provide end users with all-new speech- and text-based AI experiences based on highly natural AI-supported communication. DOCOMO will organize information sessions (in Japanese only) about its new API initiative for partner companies at AI EXPO in Tokyo from June 28 to 30. Uses behavior prediction and modeling cultivated through services, such as DOCOMO's AI Infotainment Service for vehicles, to provide increasingly enhanced information tailored to each user's specific needs and at the appropriate times. Uses natural language understanding (NLU) technology cultivated through services such as DOCOMO's Shabette-Concier service (used more than 1.8 billion times) to provide services with increasingly enhanced natural dialogue. Uses Device Web API technology to create a single application that can control diverse IoT devices based on various communication standards. An AI agent makes it possible to accurately respond to the individual needs of each user, provide highly tailored services and interface with users through speech- and text-based dialogue for the operation of IoT devices, enabling users to interact with services that are highly suited to their specific needs and situations.